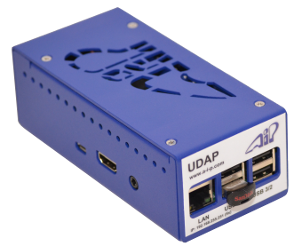 This version of the UDAP fits into the back of a 19" IOX. This safes space in the monitoring station and helps to prevent cable clutter. 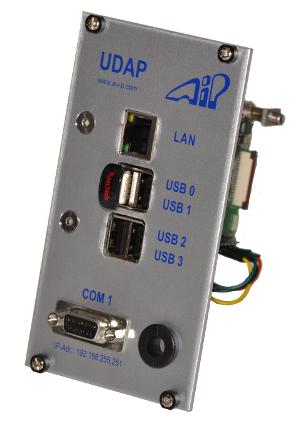 Connected to a TV set, monitor or projector over HDMI, the UDAP provides the presentation of measured values and other information. The standalone version is equipped with a robust metal case and is used when the installation of the built-in version is not suitable. 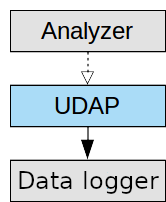 In certain use cases, the UDAP can be used as an inexpensive aquisition and monitory system. The prerequisite is that at most one serial port and four analog interfaces are required.